Sunchokes are the roots of a sunflower, native to the Americas, that because of historical quirks and misunderstandings are also known as Jerusalem artichokes. Which is unfortunate, because they have nothing to do with Jerusalem or artichokes and everything to do with a native American product we can be really proud of. For me, sunchokes roasted with olive oil and sprinkled with coarse salt provides one of the most delicious mouthfuls in the world. Cool them, toss them with a creamy garlic dressing (plus a little chile and a few herbs) and you’ve got a dynamic farmers market salad to serve with grilled halibut or walleye, grilled chicken thighs or pork chops—grilled anything, really. When you have to contribute a dish to a picnic, this is the kind of dish that will wow them. Your choice of creamy element (mayonnaise, sour cream or yogurt) will determine whether the salad turns out lusciously creamy, brightly creamy or just plain bright. The limey solids of Roasted Garlic Mojo deliver the most flavor here, but if you’re short on time you can use 4 roasted, peeled and finely chopped garlic cloves instead (roast them unpeeled in a dry skillet over medium heat, turning regularly until soft and browned, 10 to 15 minutes). If you’re thinking about plating this salad individually, I suggest that you nestle it into baby arugula, watercress or frisée. Turn on the oven to 400 degrees. On a rimmed baking sheet, toss the sunchoke pieces with theolive oil and a generous sprinkling of salt. Slide them into the oven and roast, turning them with a spatula every few minutes, until they are completely tender and beginning to brown, about 45 minutes. Cool. 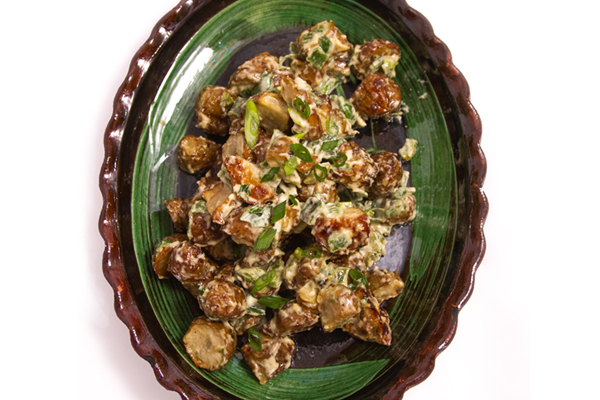 Add the sunchokes to the bowl, then measure in the mayonnaise (or one of its stand ins), the green onion, the mojo solids and your herb of choice. Stir everything together. Taste and season with salt (the sour cream and yogurt versions will take at least ¼ teaspoon). I think this salad tastes best when the flavors mingle for an hour or two in the refrigerator. Riffs on Roasted Sunchoke Salad: Of course, this same delicious salad can be made with roasted fingerling or new potatoes,carrots, sweet potatoes, parsnips, little turnips—pretty much any vegetable you can toss with oil and roast. In a large (10-inch) dry skillet, roast 4 heads of garlic (separated into cloves but not peeled) over medium heat, turning regularly until they’re soft and blackened in spots, 10 to 15 minutes. Cool, peel, place in a food processor and pulse until roughly chopped. Turn the machine on and add 2 cupsolive oil in a steady stream. Stop the machine, add ¼ cup lime juice and ½ teaspoon salt and pulse to incorporate. Store refrigerated in a sealed container.